ZAMBIA: LEARNING EVERY STEP OF THE WAY - Yusuf Kalyango Jr.
Zambia’s capital city, Lusaka, (where OU students stayed during the majority of their trip abroad), was quite modern and full of traffic-filled highways lined with tall buildings. However, just outside the city limits -- sometimes less than a ten minute drive -- there are villages with little infrastructure or modernization. Eighteen Ohio University students embarked on a journey on Nov. 25, 2011 that turned out to be even more life changing than they had anticipated. The students—from various media and communications-related majors—arrived in Zambia, Africa after more than 20 hours of flight, where they began a jam-packed three-week study abroad program. Their first experience in Africa was transiting through the modernized O.R. Tambo International Airport in Johannesburg, South Africa, which quickly dispelled any misconceptions they may have had about African development as a whole. Their arrival to the four-star Cresta Golfview Hotel in the considerably Westernized Zambian capital city of Lusaka only furthered that reality. Traffic on the road was constant and intense. Tall buildings equipped with electricity and Internet access lined the city streets. On the surface, Lusaka looked like it could be a city in the U.S. However, that is not to say it actually is like a city in the U.S. By U.S. standards, food service was incredibly slow and often, menu items were not available at all. Internet access—whenever it worked—was also sluggish. Rolling electricity blackouts were common. Toilet paper was a luxury. And that is the capital city. Huts made with combinations of straw, wood, mud, bricks and other natural materials were scattered in the slums of the countryside, sometimes connected by dirt roads and, in other instances, not connected at all. Such villages had little or no access to electricity. Villagers sometimes had to walk miles to gather safe drinking water. “Toilets” were literally holes in the ground called pit latrines. Preventable disease and other health-related hazards were quite rampant. 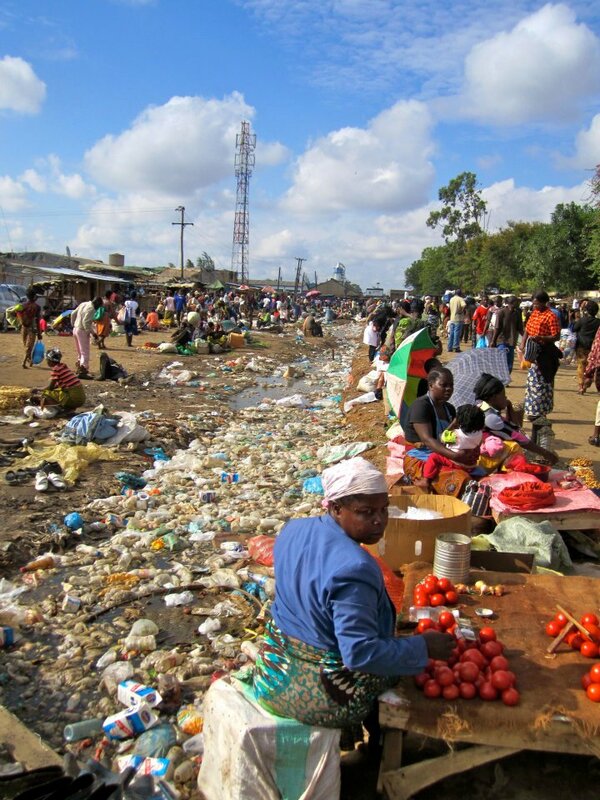 Hundreds of Zambians sprawled their goods out at congested marketplaces, crammed in muddy, low-lying areas lined with trash and infested with flies. They did this every day; their only source of income came from the products they sold. Children who, in most cases, had lost their parents to HIV and AIDS resided at places such as Kasisi Children’s Home. When students visited Kasisi, they realized that the children there, who had often been through more in ten years than many people experience in a lifetime, were still grateful and full of excitement for life. In fact, many of the Zambians were grateful and quite content with the little they had, regardless of their socioeconomic statuses or life situations. Students experienced that excitement not only in the people they met, but also when they were learning an upbeat traditional Zambian dance and while playing football (soccer) with University of Zambia students. In addition to local cultural encounters, students also traveled across the country, both to the Copperbelt Province and Livingstone. In the Copperbelt region, students toured copper mines and plants, learning first hand about the industry upon which Zambia’s economy is heavily reliant. The weekend spent in Livingstone is one many students said was the best weekend of their entire lives. From seeing Victoria Falls—widely considered one of the seven Natural Wonders of the World—to riding elephants, playing with lions and cheetahs, bungee jumping and more, the students embraced adventure, doing things they never thought they would. The students also surprised themselves in other ways, taking Zambia by storm via their internships. Students with media internships traveled around Lusaka, meeting important officials and seeing first hand how stories come together in Zambia. Others volunteered at nonprofit organizations, developing programs for and working with orphans and widows. One of the students interned at the University Teaching Hospital. Two students published three articles in two different national newspapers—the Times of Zambia and the Daily Mail. One student appeared on ZNBC national television for a nightly news segment. Other students designed entire ad campaigns and public relations plans for agencies such as Young and Rubicam. Some students who interned at S.O.S Children’s Village subsequently sponsored some of the children, a humanitarian responsibility that entails contributing money on a monthly basis in order to help pay for necessities like food and clothing. “My internship opened my eyes to the struggles in the world that are beyond our knowledge and sometimes our comprehension,” said sophomore Brooke Bunce, who interned with the Chikumbuso Women and Orphans Project. “It helped me to realize that even the simple things can help someone else in need.”Senior Lauren Nolan interned for Goman Advertising Limited. Her challenge was to market a product specifically to some of the most impoverished people in Zambia—without the use of new media. Senior Lauren Nolan interned for Goman Advertising Limited. Her challenge was to market a product specifically to some of the most impoverished people in Zambia—without the use of new media. “The markets I was working to connect with don’t have refrigerators, let alone computers and Internet connection,” she said. That was not the only hurdle she had to overcome, however. Zambia consists of nine culturally distinct provinces in which there are more than 70 dialects total. The more impoverished an area is, the less likely its residents are to be fluent in the country’s official language—English. “I learned how overcoming language barriers is the first, and most vital, step in creating meaningful communications for consumers,” Nolan said. Through their internships, students observed places in Zambia they would not have otherwise seen and received cultural advice they would not have otherwise obtained. The internships proved to play an imperative role in the study abroad program. A final component of the study abroad program, as expected, was the classes. Students commuted to the nearby University of Zambia twice a week to take two journalism courses, learning about different aspects of Zambian media and culture from UNZA communications lecturer Kenny Makungu as well as multiple guest speakers. While spending time on the UNZA campus, OU students were able to meet and become close with several UNZA students. The two groups of students participated in many events together and regularly engaged in conversations about cultural differences—everything from politics to food to popular music. The importance and impact of the friendships between OU and UNZA students—many of which are still in contact—is immeasurable. OU students went abroad to Zambia fully expecting to learn from their courses. When they returned, however, they realized they had learned from every single moment they spent in Zambia.